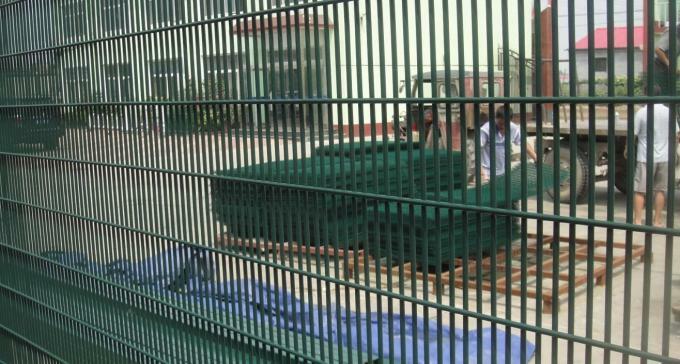 Premier 358 High Security Mesh Fence is extremely difficult to penetrate, with the small mesh aperture being effectively finger proof, and extremely difficult to attack using conventional hand tools. '358' comes from its measurements 3" x 0.5" x 8 gauge which equates to approx. 76.2mm x 12.7mm x 4mm in metric. 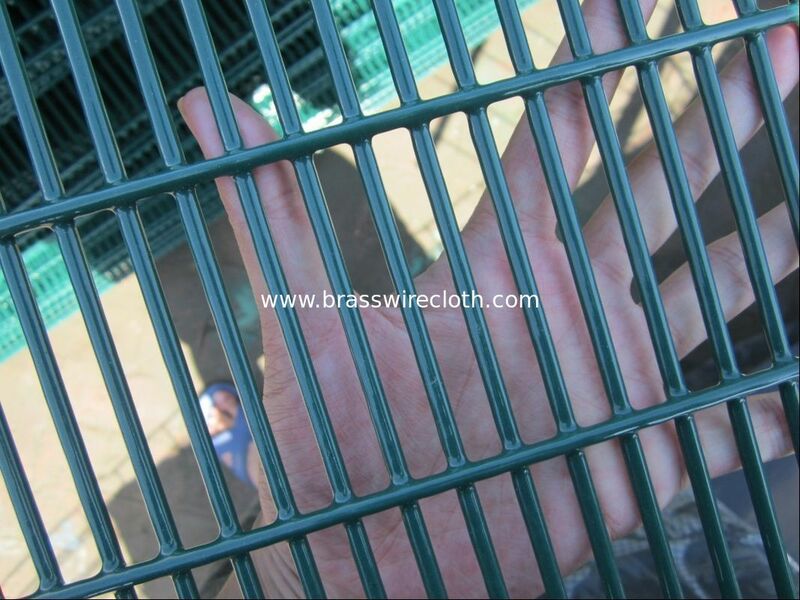 3.Fence panel manufactured from low carbon steel wire,then with heavy hot dipped galvanized coating. 4.Fence panel manufactured from Galfan wire,then with powder coating. Internally and externally galvanized (minimum 250g/m2 both sides combined).Powder coating(minimum60um). Colors:RAL6005,RAL9005.Other colors also are available. 80x60mm and 120x60mm are metal caps. 1.Metal clips with post and mesh panel. 2.Cover plate with bolts with post and mesh panel. 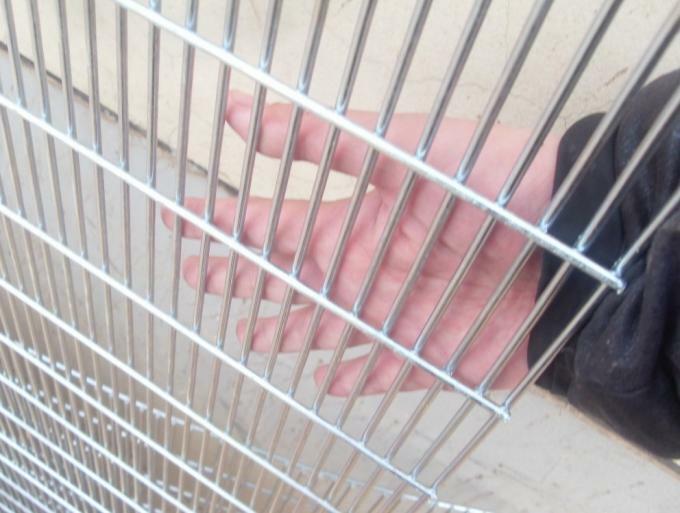 Securextra 358 security mesh is available in both pre-galvanized and galfan wire, our anti-climb high security 358 prison mesh is specified by the home office and used extensively throughout prisons, secure hospitals and other high security applications. 358 Security Fencing System is the ultimate heavy duty welded mesh panel for providing the highest degree of security with the most discreet visual impact on the environment. The panel has the same toe and finger proof profile as Securextra 358 and is further enhanced by the inclusion of 5.5mm vertical wires and additional 3.5mm wires at 144mm centres to improve rigidity. The design makes it very difficult to cut through the panel with simple hand tools. The high quality coating gives Securextra fencing a low maintenance and long life. 75mm x 12mm welded at each intersection. Horizontal wires: 3.5mm diameter at 12mm centres on the attack face, and intermittent 3.5mmm double wires at 144 mm centres on the inside face. Vertical wires: 5.5mm diameter at 75mm centres.